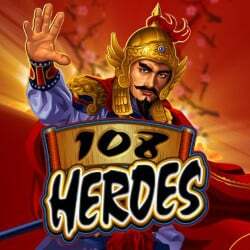 Play Microgaming’s new online slot, 108 Heroes and you could win 120,000 in coins! 108 Heroes can be played on your Desktop and mobile devices, meaning you will not lose any opportunity to win when you are feeling lucky. This slot offers spectacular features such as the King’s Treasure Bonus Game and the popular Free Spins feature. These rewarding features will give you more chances to win big. 108 Heroes has 5×3 reels, 15 fixed paylines, Wild and Scatter symbols and multipliers. Register a new account at any of the Microgaming Casinos and play for free. As soon as you have registered, make your first deposit, claim your Welcome Bonus and start playing 108 Heroes from the comfort of your own home. Land 3 or more of the Bonus Chest symbols, and you will trigger the King’s Treasure Bonus Game. Depending on the number of the treasure chests that trigger the bonus feature, they will determine the amount of picks you have during the feature. You will be prompted to choose 3, 4 or 5 chests out of 12. When you pick a treasure chest, it will reveal an amount. The chests picked will sum up to your total bonus win. This feature can be triggered during the base game and the Free Spins feature. When you land 3 or more Scatter symbols of the Liang Mountain, you will land yourself 10 Free Spins. All your wins during the Free Spins feature will be tripled. Free Spins can be retriggered, and you can land the King’s Treasure Bonus during this feature. Land one, two, or three multipliers on a payline, and you will win a prize. The more multipliers you land, the more you will increase your winnings. Multiplier symbols are Wilds and will substitute the Bar and Seven symbols. When a Wild Multiplier is in a winning combination with Bars and Seven, it will multiply the payline prize by the involved multiplier. When you land two or more multipliers on the centre reel during the base game, you will trigger a respin. During the respin the centre reel will be locked and the first and third reel will respin. Your winnings during the respin feature will be doubled. All your bets and lines played during the feature will be the same as the initial bet that triggered the respin. 108 Heroes features some phenomenal visuals that will connect you to the Chinese martial arts world. The graphics are lively and colourful, and they come together perfectly painting a picture of the four awesome characters of the slot. A strong Asian influence is evident in the game with the sound inspired by the Chinese culture, and it’s intensified during the bonus game to draw you into the excitement of the slot. Go ahead and unite with the 108 Heroes of Liang Mountain and reclaim the treasure for a chance to change your fortune forever.